The two sponsors of the race, CAFNR and The Food Bank, begin their race. The swan raced neck-and-neck with the Gumdrop Express, the yellow duck with its giant head steadily guided her ducklings to shore, while the Crawdaddy clawed its way to the finish line. 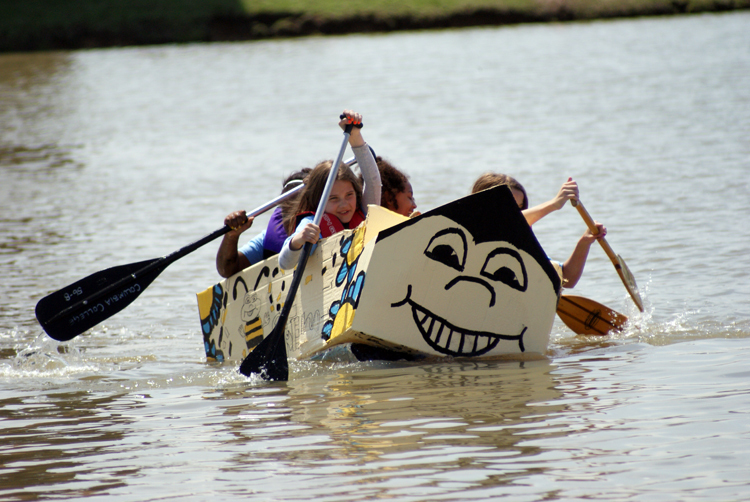 Forty-six cardboard boats constructed by student groups, community organizations, businesses, individuals, families and media companies competed in the April 20 Float Your Boat for the Food Bank race in Columbia. Not everyone made it to the finish line. The race was a fundraiser to help The Food Bank for Central and Northeast Missouri feed hungry Missourians. More than $17,000 in donations were collected. Boats were constructed of cardboard, duct tape and glue, and the imagination of their builders. They included pink race cars, Viking war boats, pirate ships and canoes with puppy dog faces. “Every dollar raised equals 11 meals or 15 pounds of food on tables in the 32 counties served by The Food Bank,” said Chris Sisk, special events coordinator at The Food Bank. The race is a joint effort by CAFNR and The Food Bank. Last year’s inaugural race attracted 20 boats, and raised $2,460 in cash and approximately 1,800 pounds of food donations. Taking first place this year was HMS Dragon One, captained by Brad Dudenhoffer of Columbia. His boat, resembling a long canoe, traversed the course at Bass Pro Lake in northeastern Columbia in 48.71 seconds. The Nautilus also was given the Modern Marvel Award. 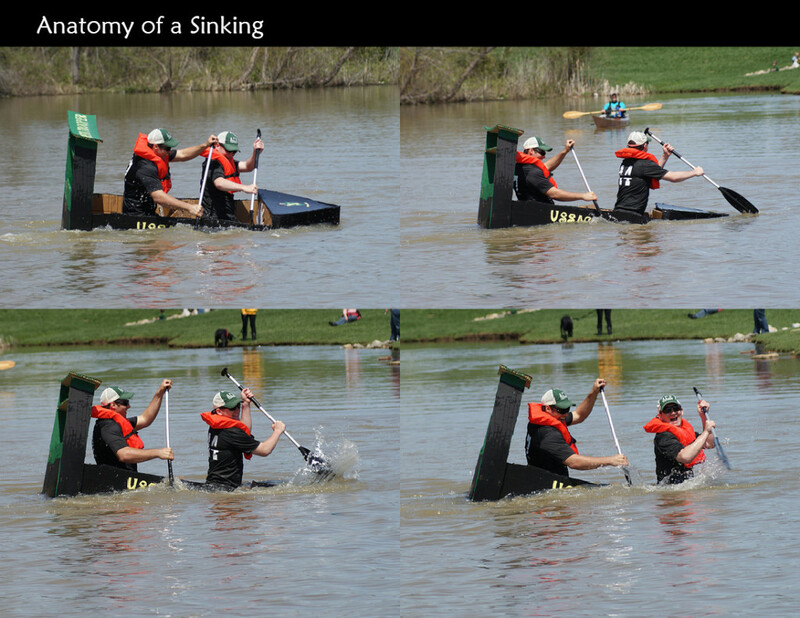 The boat Twocat, captained by Daniel Zumwalt, took second place with a time of one minute, three seconds. Third place was won by The Seaworthy captained by Michel Smith of Columbia. The Twocat team also won the I Can’t Believe Its Cardboard Award. 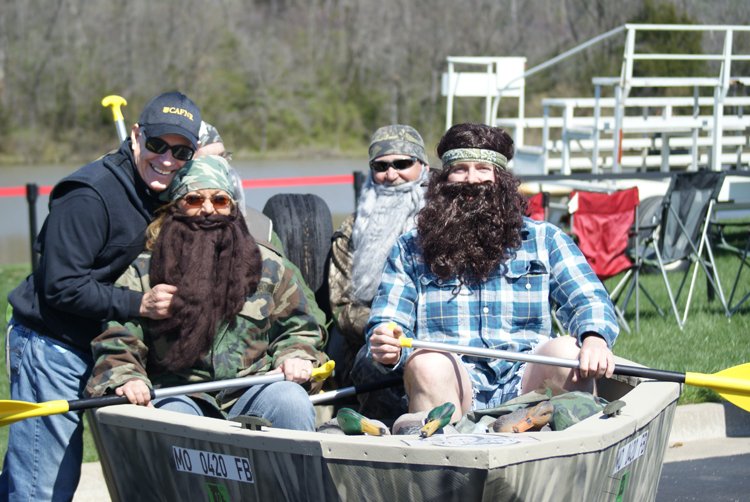 Vice Chancellor and CAFNR Dean Tom Payne readies the College’s team for the race. The Best in Show was The Food Bank Truck, a large cardboard box painted to look like the organization’s delivery vehicles. It was captained by Neal Lloyd of Columbia. The People’s Choice Award, chosen by the amount of donations raised at the race, was presented to The Crawdaddy, captained by Tony Thorpe, senior research specialist in Fisheries and Wildlife at the MU School of Natural Resources. His team raised $2,260. 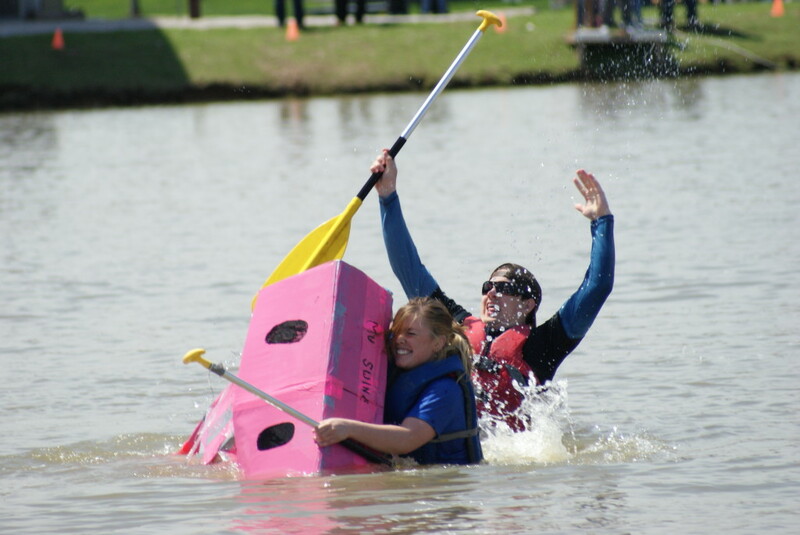 The boat, which featured the large pincers and head of a crawdad, was also given the Best Theme prize. It capsized at the beginning of its race. The Titanic Award for Best Sinking was awarded to the Choo Choo Train captained by Levi Knipmeyer of Columbia. His boat resembled a Santa Fe locomotive of the 1950s. Slow but sure, mamma duck heads to the finish line. The Hawaiian Party Pontoon Boat, captained by Glen Wylie of Columbia, was presented the Spirit Award. 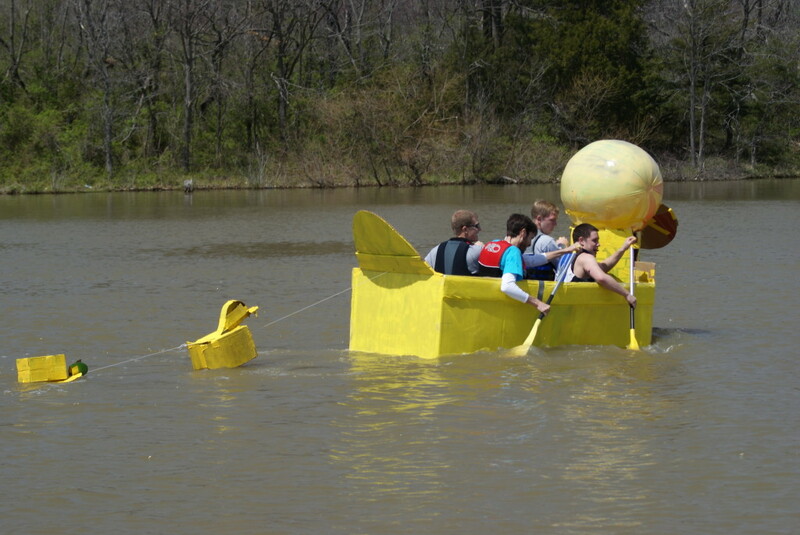 The Ugliest Boat prize went to the Agricultural Education Society of the University of Missouri. The winner of the Pirate Class was a craft built by students of the Citizen’s Police Academy, Columbia. The Food Bank is a non-governmental agency. More than 92 percent of its funding comes from donations, fundraising events and grants. The Food Bank helps to feed more than 100,000 people each month in 32 counties in central and northeast Missouri, said Executive Director Peggy Kirkpatrick. It distributes free food to 138 elementary schools through the Buddy Pack Program, a weekend food service for children; and 135 hunger-relief agencies, such as food pantries, soup kitchens and shelters.